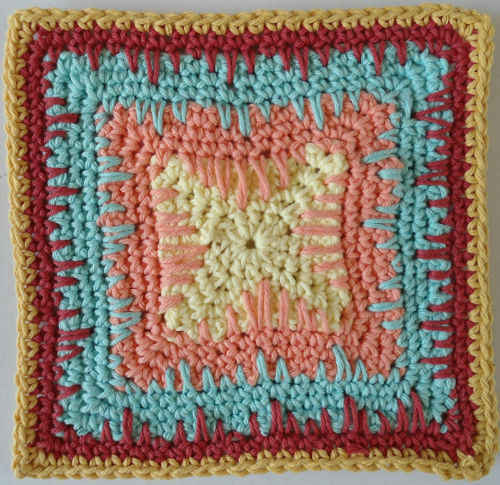 This week we have had 17 dishcloths submitted for the Dishcloth-a-Day Challenge. We now have enough dishcloths for the month of January and February! I am so excited!! 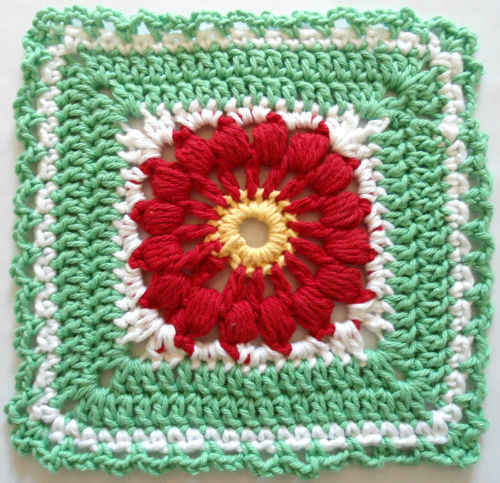 Two of the dishcloths are so cute! One is a container of Popcorn and the other is a Snow Lady! Thank you, thank you, to all those who have helped so far. Rows 2-3: Ch 1, turn, working in front loops only, sc in each sc across. At the end of Row 3, change color to White. Rows 4-5: With White, ch 1, turn, working in front loops only, sc in each sc across. At the end of Row 5, pick up Purple. Rows 6-9: With Purple, ch 1, turn, working in front loops only, sc in each sc across. At the end of Row 9, pick up White. Rows 10-21: Rep Rows 4-9 twice. Rows 22-23: Rep Rows 4-5 once. 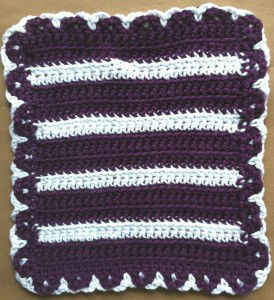 Rows 24-26: With Purple, ch 1, turn, working in front loops only, sc in each sc across. DO NOT FINISH OFF. Rnd 1: (Right Side) With Purple, * working in sides of rows, sc in each row *, working in unused lps of starting ch, 2 sc in first ch, (sc in next ch) across to last ch, 2 sc in last ch; rep from * to *; working in Row 26, working in both loops, 2 sc in first sc, (sc in next sc) across to last sc, 2 sc in last sc; join with sl st to first sc. Rnd 2: Ch 1, sc in same st as joining, ch 3, (skip next sc, sc in next sc, ch 3) around; join. Finish off Purple and weave in ends. Rnd 3: With right side facing, join White with sc to any skipped sc on Rnd 2 (Purple ch-3 lp to back), ch 3, * with Purple ch-3 lp to front, sc in next skipped sc, ch 3, with Purple ch-3 lp to back, sc in next skipped sc, ch 3; rep from * around; join. Finish off and weave in ends. 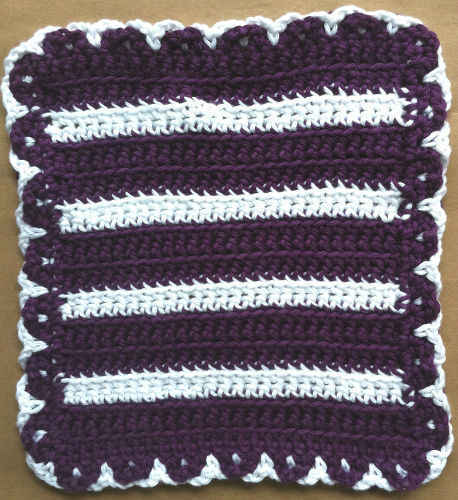 There may be a problem with the number of stitches as 3 of the 4 sides have 7 loops in plum and one edge only has 6. 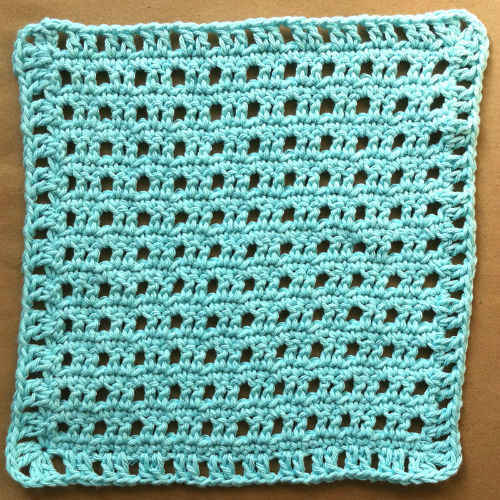 Another really pretty dishcloth! Thank you for the fun!